Welcome to Surgical Specialists of SW Florida, where our surgeons specialize in General and Vascular Surgery. We are committed to providing each patient with an exceptional level of care and attention. At Surgical Specialists of SW Florida, we are proud to be physician owned and operated. Our dedicated staff works together as a team to provide high-quality comprehensive care. Our compassionate and understanding doctors take pride in giving each patient’s needs the attention and care needed to see them on their way to a better, healthier outcome and enhanced lifestyle. Surgical Specialists of SW Florida is conveniently located in Fort Myers. Our office hours are Monday thru Friday 8 a.m. to 5 p.m., and accept same-day appointments (based on availability). We always have a nurse available to assist you with your concerns, however big or small. 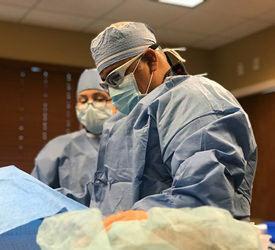 The Patient Portal is a private website that Surgical Specialists of Southwest Florida uses to communicate with our patients and allows our patients to securely manage their healthcare needs quickly and conveniently. Visit our Patient education Section for information resources on common conditions we treat. Learn about treatments, tests and conditions and get information on what to expect before and after surgery.